In the most basic sense, FedBizOpps (short for Federal Business Opportunities, sometimes known as FBO) is where contracting officers will post opportunities that are valued at over $25,000. Think of it as a place online where government agencies can post “Help Wanted” ads for contractors. However, that’s not all that FBO.gov does. You can also use this site to keep track of upcoming opportunities by searching for presolicitations or sources sought. There are also features that allow you to keep track of any changes made to solicitations. Finally, some resources on FBO can be used towards researching past awarded contracts. You don’t need an account to search FedBizOpps. However, it’s highly recommended if you’re serious about government contracting and growing your business. Making your own account on FedBizOpps isn’t that difficult to do. 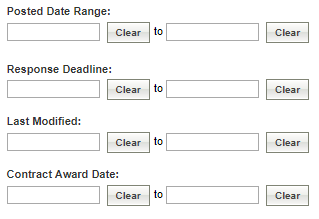 In fact, if you’re already have a System for Award Management registration, most of the work has already been done. Follow the steps below to create an account. If you already have an account, continue to the next section. Visit FBO.gov in your browser. Towards the bottom of the home page, you will scroll down and see two boxes. The blue one is for Buyers/Engineers and the green one is for Vendors/Citizens. 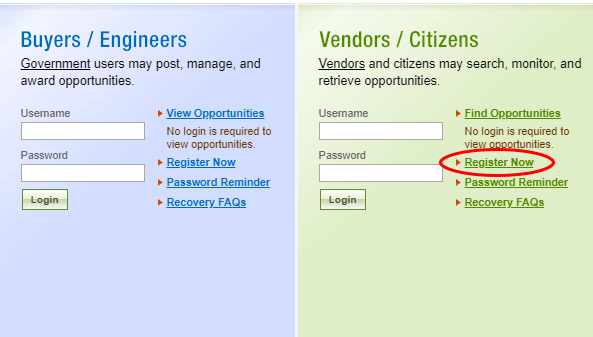 Click on “Register Now” in the green Vendors/Citizens box. You will then be asked to enter in your DUNS (Data Universal Numbering System) number. This is a unique 9 digit number that’s assigned to each physical location of a business. 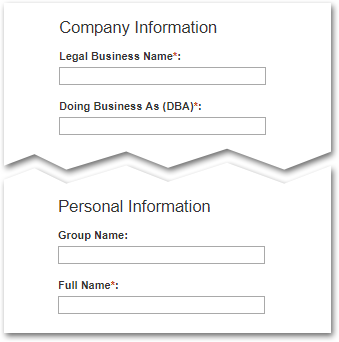 After that page, if your business is not registered in SAM, you will need to manually fill out other company information such as your legal business name, “doing business as,” your CAGE number, division name, physical address, and plenty of other forms of standard information. Afterward, you will fill in your personal information which includes name, email address, phone number, etc. When you’ve completed this page, and submitted your information, you have one final step: To verify your account by clicking the link sent to your email address. Click the link and sign in. You’re one step closer to winning a government contract. Now, all you have to do is to find the right opportunity for your business. You’re on your way to getting awarded a government contract. Now, all you have to do is to find the right opportunity for your business. Now it’s time to start using FedBizOpps to help you make money and grow your business. If you can’t find the right opportunity, you’re not going to get anywhere in the federal marketplace. If you’re logged into your account, you will find that the Opportunities bar will be the third to the right otherwise it will be on the fourth. Click on it, and let’s begin. You will find all opportunities that have been posted in the last 90 days. Scrolling below, you will find various criteria. Some of it will be useful, some of it will not. We’re going to guide you on how to effectively search for an opportunity. On the first level of the Advanced Search, you will find four search criteria. This consists of the Posted Date, Place of Performance State, Place of Performance Zip Code and the Documents to Search. In the Posted Date, you will find a time frame in which contracting officers put their opportunities on FedBizOpps. The more recent an opportunity, the more time you’ll usually have to prepare for it. The Place of Performance State will also include U.S. territories and there will also be a non-U.S. option. To find an opportunity to bid on, you will search by Active Documents. If you want to do market research by obtaining info on past contracts, then click on Archived Documents. To find an opportunity to bid on, you will search by Active Documents. If you want to do market research by obtaining info on past contracts, then click on Archived Documents. If you’ve already registered for your set-asides, then you will know which ones to check off. If you’re not familiar with set-asides, it’s basically a program enacted by the federal government to get small businesses more involved with federal contracting. From the over $500 billion that gets awarded every year, about 23% of is solely awarded to small businesses. This means that the government has a general concept for a contract, but they’re testing the waters before they decide to get to work on creating a solicitation. You can respond to sources sought notice and get placed on an interested vendors list. Sometimes an opportunity doesn’t make it past the sources sought phase. When it does, a presolicitation notice will be given as a preview for an upcoming solicitation. Changes occur frequently for contract solicitations in both the public or private sectors. Sometimes they can be major, other times it can just be the correction of a spelling error. Stay on top of changes so that you can stay compliant with a solicitation’s requirements. Use this option if you are searching to work with a specific federal government agency. As you’re starting out in government contracting, you’re not going to really need this field as you’re trying to search based on who needs your goods or services. Later on down the line, as you start to build relationships, then you will want to search by the agencies in which you’ve worked with before. By this time, you will have a solid idea of who wants what. In that case, you will select the Specific Agency/Office/Location. This will work like pretty much any other keyword match. On FedBizOpps you can search multiple terms at once. If you typed in “space AND flight” for example, it would read it as simply “space flight.” When multiple terms are put into the keywords search like this, it will turn up with results containing the terms within 20 words of each other. If you put in “space NOT flight,” it will simply come up with results that have space but not flight in it. The solicitation number is basically a unique identifier if you’re looking for a specific solicitation. If you’re a novice or seasoned government contractor, this is one of the most useful search fields on FedBizOpps. NAICS stands for North American Industry Classification System. Every industry has their own NAICS code. When opportunities are posted, they will have an associated NAICS code so that contractors in that industry can bid on them . Your business could have multiple NAICS codes, and you can even search by keywords in this field. This section is pretty self-explanatory. You can search by the date ranges associated with the opportunity. By searching these ranges you can find opportunities that are still live and available. If you want to get the most out of FedBizOpps and your account, you’re going to need to be able to save your searches. On FBO, this is also known as “Creating a Search Agent.” When you have a search agent, you can easily repeat your most common searches. To begin saving searches, you’re going to start at Opportunities again, but instead of Advanced Search, you will click on Search Agents. It will be on the first bar on your left. Then you will click on Search Agent. Pretty much, all of the search criteria that we just went will be there. 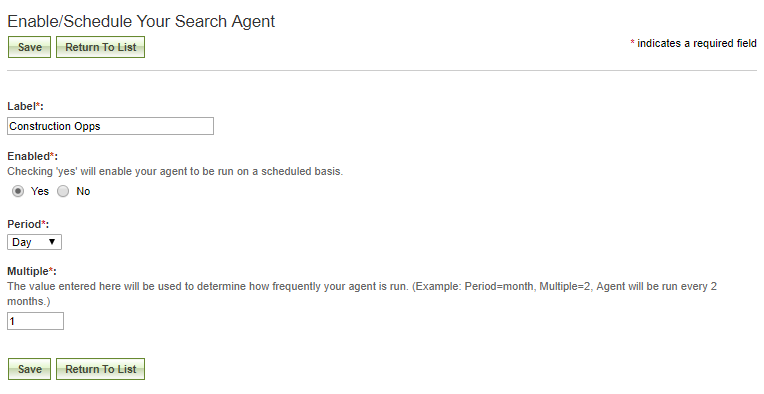 It’s 1 for 1 copy of the Advanced Search with the option of saving it as a Search Agent towards the end. After that, you will reach a scheduling page. You can give your search a label to keep note of what you have been looking for and then you can schedule the search from a daily, weekly, to monthly basis. Watching an opportunity helps you keep updated as the government process continues. As mentioned before, government contracts have a “lifecycle.” So if you find something in the Sources Sought phase that stuck out to you, you can watch it to see if it becomes a solicitation. To do this, go into the opportunities list and carry out your search as usual. Then, when you find an opportunity or solicitation, under the notice details, but above the synopsis, there will be the option to watch the opportunity. Simply click “Watch this Opportunity,” and it will appear in your “Watched” tab. With both of these features, however, you need to realize that time is of the essence. Although FedBizOpps is the official government website for finding contracting opportunities, there are various tools developed by third parties. Conduct searches easily without needing an extensive guide (like this). Finding a Solicitation, What’s Next? So you’ve successfully navigated FedBizOpps and stumbled upon an opportunity that seems like a great fit. You’ve completed a pretty important part of the process, but then again, it’s only one part of it. As mentioned before, the Synopsis/Solicitation phase means that the opportunity is up for grabs. However, before you even begin typing up your proposal, you need to know how to properly analyze one. On the solicitation page on FedBizOpps, you will be able to find the Solicitation Number, Notice Type, and a brief synopsis which gives a brief description of the contract. 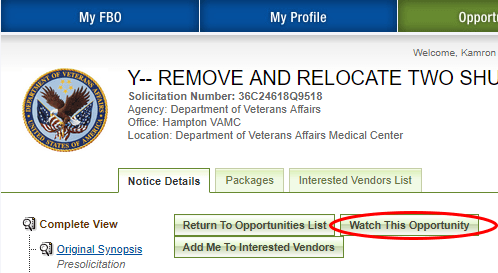 If you are interested in the solicitation, then simply click on “Watch this Opportunity” to keep track of it on FedBizOpps. Still, you’re going to have to write a pretty good proposal to get that contract. So why not get assistance with USFCR proposal writing services? We’ll also give you training for the bidding process, live chat seminars with contracting experts, and list of government contacts specifically catered to your business. 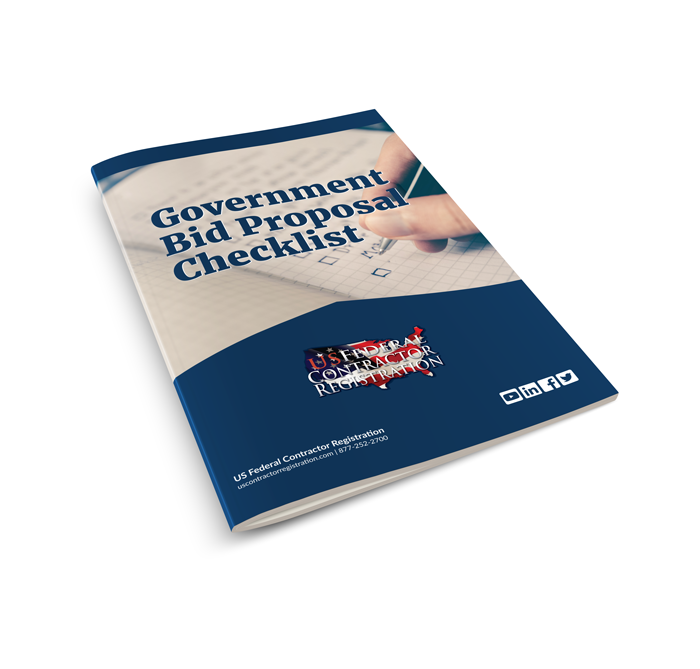 Also, be sure to download our proposal writing checklist. Just from the look of the site, you can tell that FedBizOpps, much like any other government website is dated. It’s been around since 2002 and not much has changed within the last decade. Besides that, you need to know the limits and what features are missing from the site. As mentioned before, you could be using FBO to get information on opportunities, but your competition can be using speedier methods research…or better yet, YOU could be using speedier methods for research. You can’t find state and local government contracting opportunities on FedBizOpps. You’re going to have to search on other sites for that. Plus, there are also plenty of opportunities on FedBid.com. Wouldn’t it be easier if it were all in one place? We think so. How do you win a federal contract? You place better than your competition. How will you gather info on your competitors? Well, you’re not going to call them…and you’re not going to find much on FedBizOpps. Perhaps there is somewhere you could find government contracts as well as dig up information about other vendors, their past contracts or even prime contractors that you can work with. Government contracting isn’t just about picking up one opportunity out of FedBizOpps. What’s the point of that? It’s about developing a system that will open up a path of revenue for your business. It’s about getting your foot in the door, creating success, and repeating that success. FBO is just the “Help Wanted” board with a few neat features. That’s it. There’s not much there to help you. That’s what US Federal Contractor Registration is for. Don't lose your next bid from a simple mistake. Learn crucial tips you should apply to every proposal with our checklist. Receive the handbook and a free consultation with an Acquisition Specialist to learn about the Simplified Acquisition Program only available from USFCR. Fill out the form below to receive your checklist and free consultation! For free government contracting news and tips, subscribe to our social media channels.